The new Silverado HD receives two powertrain options: an all-new gasoline V-8 with direct injection mated to a 6-speed automatic transmission and a redone version of the truck’s venerable 6.6L Duramax turbodiesel V-8. 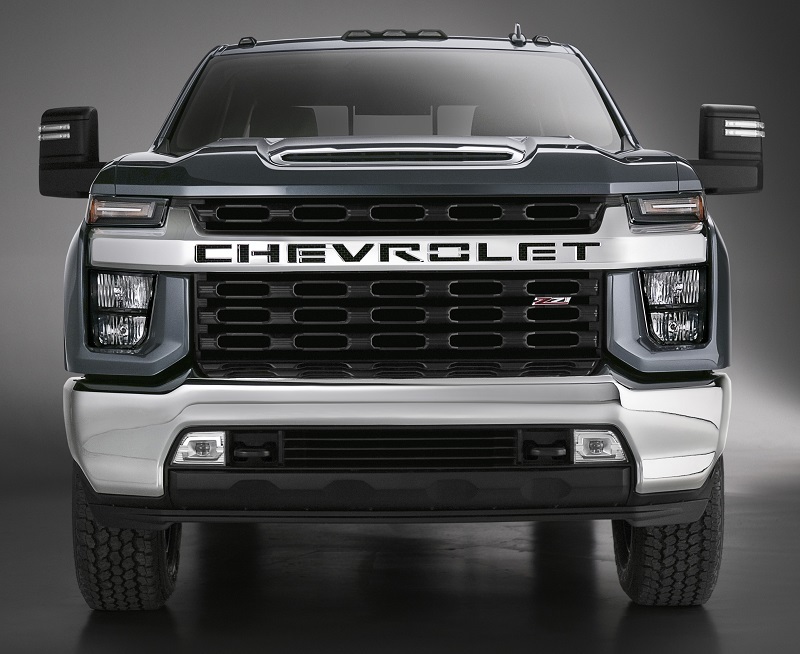 SCOTTSDALE, AZ – Calling it the most capable and advanced Chevrolet Silverado HD it has built, General Motors will debut the latest generation of its big-bruiser pickup with two new engines in February. “We know the needs and priorities of heavy-duty customers are different than those of either light-duty or medium-duty customers,” says ’20 Silverado HD chief engineer Jaclyn McQuaid. “As such, we built a heavy-duty truck tailor-made for them that has more differentiation than ever before from light-duty models, offers advanced towing technologies to improve towing confidence and includes new features such as the integrated Bedstep, which makes it easier to access the bed while pulling a fifth-wheel trailer,” McQuaid says in a statement. The integrated step is located just forward of the rear wheels. The bumper also receives an integrated step, although it is bigger for ’20 to accommodate steel-toe boots. Shown to journalists here last month in mock-up form during a Chevy trucks event, the three-quarter-ton Silverado HD shares a roof with the light-duty model but that is where is where the similarities end. It towers over the half-ton model with heavily chiseled lines, pushing design in the segment even closer to big-rig styling. The new Silverado HD, which will be unveiled in sheet metal ahead of the Chicago auto show and possibly at its Flint, MI, assembly site, receives two powertrain options: an all-new gasoline V-8 with direct injection mated to a 6-speed automatic transmission and a redone version of the truck’s venerable 6.6L Duramax turbodiesel V-8. The turbodiesel will deliver 910 lb.-ft. (1,234 Nm) of torque and channel it to the road via an all-new Allison 10-speed automatic transmission. Additional details on the gasoline engine, likely of 6.6L displacement as well, will come later. The truck goes on sale in the middle of next year. Inside, the most prominent change to the Silverado HD is an additional 3 ins. (76 mm) of legroom in crew-cab models and a taller, more comfortable seating position, GM says. The truck also will include trailering technology to debut on the light-duty model earlier this year, as well as greater towing and payload capacities and HD-customer-specific technologies the automaker will provide later. The Silverado HD targets two customers: buyers who need an affordable pickup capable of meeting the rigors of work and those looking for higher-end models to pull items such as horse trailers or a fifth wheel. Massive grille of Silverado HD recalls big rigs.